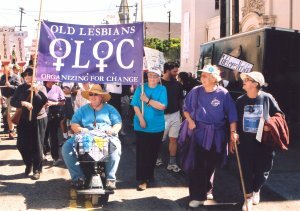 Herstory of OLOC: 1989 to 2007 The herstory is 100 pages long and includes excerpts from lots of primary documents of OLOC's early years that are stored in the OLOC archives. Each piece in the Herstory is the result of a coordinated effort between Arden Eversmeyer,Margaret Purcell, and Mary Henry. Vera Martin carefully reviewed it. Martin is aco-founder of OLOC and she and Eversmeyer are former OLOC Co-Directors. Purcell did the major work of searching for and extracting material from the archives and also did the layout. OLOC sends her a huge thank you for this marvelous document. The Herstory is available for purchase for $20.00. Please pay by check or Paypal or by contacting ruth@oloc.org.